I'm waffling, wavering, and being wishy-washy again! house today and after looking at it for awhile, I'm wondering if I should leave it as is? It's a great quality Ethan Allen piece. I started re-thinking my original plan. very pale peachy/gold plaster finish. Here is the secretary...I think it will make a beautiful statement there. Here's where you come in, which would you choose? Ooooh black with white interior gets my vote! 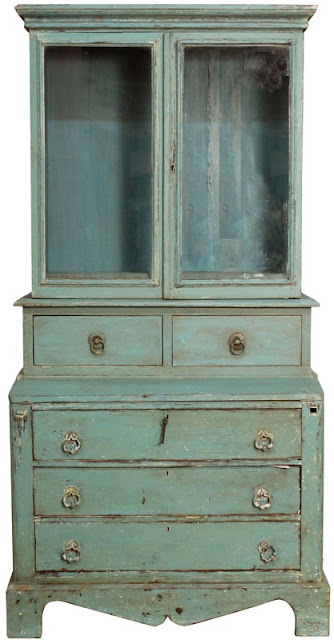 Distressed aqua patina is my favorite but not so sure it would look best with the peachy/gold walls so I vote for black. I prefer it in it's natural state, considering the space it will be in. Adding some fabric or paper to the back will give it limitless possibilities that will be easy to change. Maybe leave it as is and paint the interior with Annie Sloan Duck Egg and Dark Wax? It would pull the color from the leaded window. I am having ONE HECK of a time figuring out what to do with my newly purchased secretary! It must be contagious! Its beautiful as is. Agree that some color inside would be great. I think this time I have to go for leave as is too and paint the inside with something lighter or use paper again. I think it'll look the nicest with the area. Are you really ready for all of the combo's you are about to get? The one you have has long legs and is not bottom heavy, but top heavy. You will need to put something under it...ginger jars? Black and use a gold paint pen to highlight some details...where have I seen that? 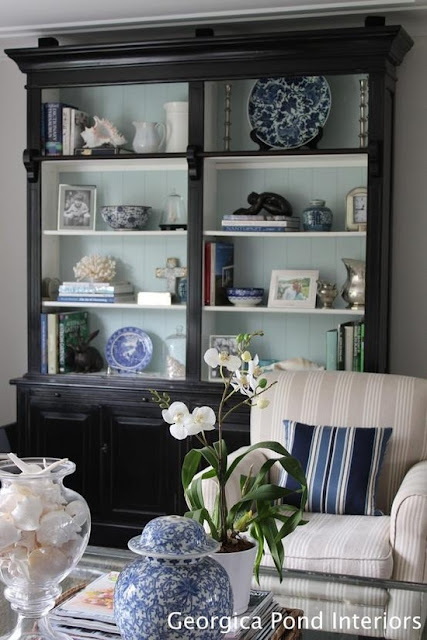 I love the black with the pale blue as well but I agree with the others that unless your parents want to paint those peach=y walls, I would leave it the way it is and line the back with paper.. And yes, add something underneath like Linda mentioned! Okay this exactly the piece I have been scouring CL for! (You know all the pictures I've been pinning for a bar?) I actually think it's finish is really pretty, with maybe the interior painted a fun color pulled from elsewhere in the foyer (artwork on another wall perhaps?) I also love it in black with the interior painted robin's egg blue or green. Lucky girl to have this to work on!! and lucky mom to be the recipient! i think the all black, second choice would be the light aqua like color!! Hard to say without seeing more of your peeps house but probably leave as is and spruce up the interior. It's a gorgeous piece. Style under it and in it and be happy!!! Aqua or the cream, whichever suits your moms tastes the best! It's a beautiful piece... Lucky you! it is gorgeous as is, but i think black would be classic! plus the trim is already wood on the adjacent window so that's enough wood for this girl. ;) i also love the way brass hardware pops against black. Gorgeous and perfect spot! I vote for glossy black with light interior. Youre a wonderful daughter to do that for them. She will love it. My sister is coming to Denver next week, sure wish I was coming with her so we could visit! Looks like everyone's given you lots to think about. Helpful or more confusing? I'll spare you mine...ha! White - w/o banging it up and making it look worn. I vote for either "as is" or black with a light interior. Can't wait to see what you choose! I just want to watch you work your magic on it. I know it will look beautiful. As is! Change the hardware? Add a splash of color in the interior through patterned wallpaper or fabric. Looking forward to the seeing the updated space. Leave it as it is and add material to the back. It really is a lovely piece! What a great piece, Pam! It looks like the perfect size for that area, too. I'm partial to the white, but I think either of the other colors would look great, too. I think the reason you are even considering painting it is that you don't LOVE the wood. I don't either, but I think that is only because the finish is not dark enough. From these photos is looks kind of "medium" brown. Why don't you just stain it or glaze it a little darker? I think black would be a little harsh with those soft curving legs, but a darker stain would be gorgeous. Love the idea of aqua, but I don't think it would look great with those walls. I love white, but it might get "lost" in the corner and with those walls. I vote for leaving as is, but maybe putting a nice wax or finish on it. Definitely not aqua or white, esp. against that wall. I would, in this case, try to preserve the original feel of the piece. We all look forward to seeing the end result! I love the black, I think it would be a nice contrast with the lighter walls. I think the pinterest inspiration room looks great because the walls are dark and really bring out the color of the wood. I do like the idea of adding paper or material to the back and leaving it as is too though. Gosh, so many different opinions. I kind of like it as it is too, perhaps painting the inside might work. Whatever you decide, it's a beautiful piece! i kinda love the idea of black with light aqua interior!!! So many great ideas from your readers! Without seeing the whole entry... I would say go for the black or blue! I agree with the above comment to live with it for awhile. Not everything has to be reinvented- especially a classic such as this. If the finish is in good shape- and even if it's not- some non-DIY people pay good $ for a distressed look-I would not paint it! I like the idea of putting a wallpaper on the back of it, or paybe painting the back for a fun pop. I think the wood goes with the wood trim around he window. It surprises me that you didn't mention what your mom would like! What's her input? I suspect (as most moms think safe!) that she would want it as is- safe and predictable- but maybe that wallpaper or pop of color on the back would shake things up a bit and be just enough to feel edgey to her? Although I'm all for re-inventing dated or damaged pieces, this one looks beautiful as is. 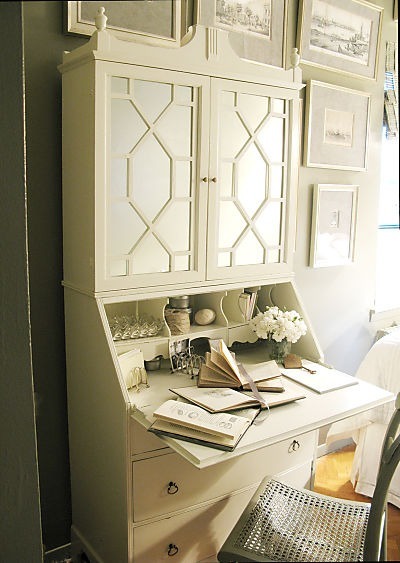 What happens in a few years when this painted furniture trend passes, and we have to hunt for untouched pieces? My vote is leave the wood, and if you want to add pop in the back of the shelves, cover or paint light-weight MDF (or even cardboard) cut to fit. It's not permanent and you can change it easily. I did it to my antique bookcase and no one has ever guessed! I go with leave as is. I like painted pieces but reserved for furniture that needs to be restored or refreshed anyway. Quality pieces are classic and will remain so when the paint phase (and it is a phase..been there before) has passed. Your piece is an heirloom type piece. I agree if you want interior accent color or pattern, make it cosmetic to match other accents. It's just beautiful...score! I choose to leave it as it is. It is a beautiful piece Pam, a future heirloom for sure. If you will re-stain it, and your mom loves the molding around the window close by, I would stain it close to that. But I would want to see the wood grain of the piece still. 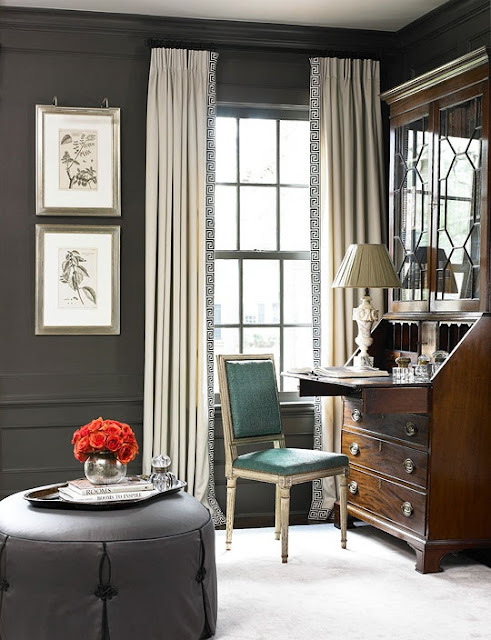 If however the piece has a lot damage on the surface and painting is your only alternative, definitely, I would go with black, since like stained furniture, this color can stand the test of time too. Good luck dear! Whatever you decide I'd put a huge basket or something, anything, beneath it. I've never understood this stye of furniture. The legs make it look like a four legged spider. It looks like it's ready to creepy-crawl away at any moment. Definitely leave as is. Goes perfect with the window moulding. The wall color will give its wood extra richness too. I love that piece and since it is an Ethan Allen piece I would tend to leave it the way it is and place a great fabric in the interior of it.....then if you decide to paint it later...the fabric is an easy change! Such a great piece and how nice to have your client give it to you!! Please leave it as is. It's a beautiful piece. I would liven up the inside with a removable panel (cardboard, foam board, etc.) with a fun wallpaper, contact paper, or fabric that could easily be changed/removed. I vote to leave as is, filled with light accessories. So many ideas here, uh oh, getting confusing! Dark was may enhance it, resulting in a richer look. I was totally thinking black with a light interior even before you listed it as an option! I think it will turn it into a knock out piece. It is very nice as-is but come-on lets be fearless! Can't wait to see what you decide, thanks for letting us give our 2c! If the finish is in good shape, leave the original finish on the outside, then do something wonderful inside the glass doors. Aqua sounds good to me. Beautiful piece Pam! I'd go black .. it's a statement piece so I would go dark. 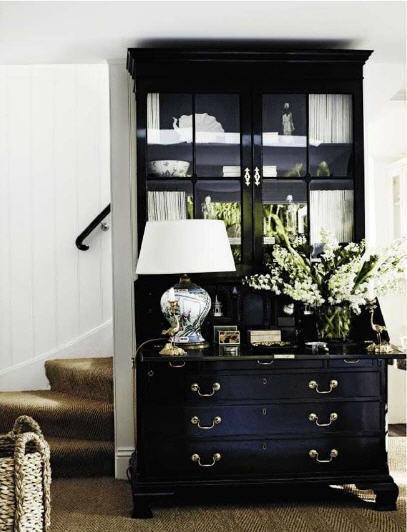 I love the blue and white pieces against the dark wood. Have fun and whatever you decide it will look great! Oh that's a tough one! Black or cream for me! I tend to agree with the majority on this one and would say leave as it ...at least for now. I would add an interesting geometric wallpaper to the inside but again I may not paint the inside because then you are committed ( as you can see I am not a risk taker). I also agree with the comment that you want something below to balance. What about an upholstered small bench that softens all the wood. Perhaps the bench could be painted an interesting color with a fabric that pops. The bench sort of fits with the function of the secretary whereas the ginger jars may look like you are trying too hard. I'm late to the comments, but how about papering some panels and fitting them on the back to brighten the inside and leaving the outside stained. I do love paint, color and black but for this piece....it looks to be in rather excellent condition. What about an aqua fabric or paper inside that could be removed. I could also see adding a vintage mirror in the back - one that has worn, weathered patina to it.